The long, choppy comeback in housing took a step back in August as the annual rate of housing starts dipped 5.8% from July, lower than analysts expected and the second consecutive decline. The start rate of single-family units fell to its lowest level since October. 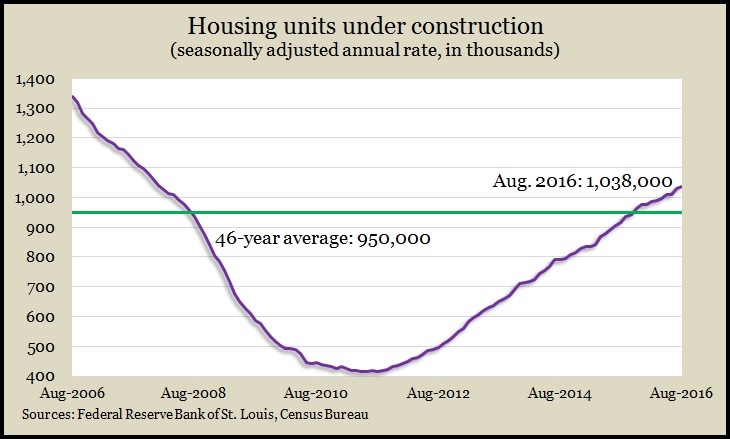 However, housing at all phases of construction rose to the highest rate since before the 2008 financial collapse. 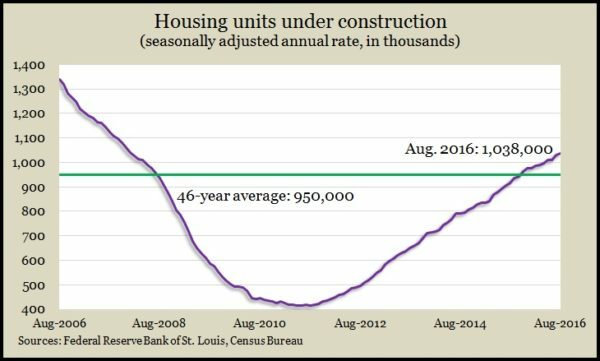 Also, building permits for single-family houses – which have greater economic ripple effects – rose and remain around pre-recession levels. The policy-making board of the Federal Reserve announced after a two-day meeting that it would keep short-term rates near record lows for now, mostly because of lack of inflation. The Federal Open Market Committee reported increased signs of a moderate pace in economic growth, picking up from a slower first half of the year. The committee said it would continue to monitor economic data and overseas developments to determine when to raise rates, which last happened in December. The annual sales rate of existing houses also fell in August, for the second month in a row. The National Association of Realtors reported an annual rate of more than 5.3 million houses sold, down nearly 1% from July and up nearly as much from August 2015. The trade group blamed an inadequate supply of houses and higher prices for shutting out some would-be buyers amid low mortgage interest rates. The inventory of houses for sale has declined from the year before for 15 consecutive months. Employers continued to be reluctant to let workers go, as indicated in the moving four-week average for initial unemployment claims, which dropped for the fifth consecutive week. According to data from the Labor Department, average claims remained 28% below the 48-year average level, which it has been below each week since the beginning of 2013. Low joblessness should help boost the confidence and wages needed to sustain U.S. economic expansion. The Conference Board said its index of leading economic indicators declined 0.2% in September, despite analyst expectations of a slight gain. An economist for the business research group said that based on the index, the U.S. economy should continue its moderate growth. Manufacturing – both in the number of hours worked and new orders received – held back the index.